Kiwikiu or Maui Parrotbill use their large parrot-like beaks to split branches and to extract insect larvae, their primary prey. Adult Kiwikiu are 5 to 6 inches long, olive-green above and yellow below, and have short tails and distinctive yellow eye-stripes. Females tend to be less colorful and have smaller bills than males. Immatures are greyish-olive above and pale yellow below with whitish eye-stripes. See a video of an adult male Kiwikiu foraging in the wild. Here a banded male uses his over-sized bill to dig in bark of an ‘ōhi‘a tree in the search for insect larvae. The original Hawaiian name was lost in history but a new name, Kiwikiu, was created by the Hawaiian Lexicon Committee in 2010. Watch the naming ceremony here. 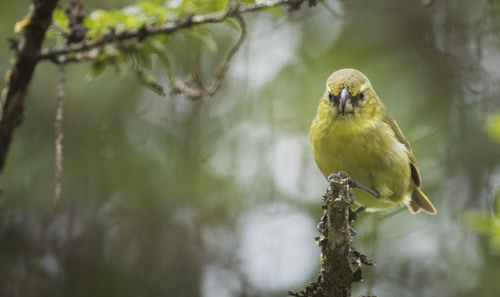 Hear the chips, whistles and song of Kiwikiu in the wild. It’s a rare and exciting thing to encounter a wild Kiwikiu and it most often happens after hearing their calls. Kiwikiu live as long as 16 years forming socially monogamous pairs that typically produce only a single offspring every year or two. Immature birds remain with their parents for 5-17 months. Pairs occupy home ranges as large as 14.5 hectares (35.8 acres). 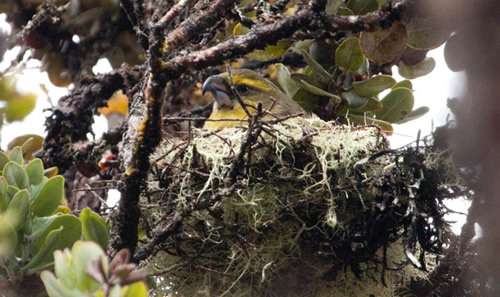 Kiwikiu is presently restricted to high elevation wet ʻōhiʻa forests on northeastern Maui. They are typically found foraging on branches of native plants like ʻōhiʻa, ‘ākala, koa, ‘ōlapa, pilo, and kanawao. They will also split open berries for insect larvae. Formerly found all over Maui and Moloka’i. Now, only fewer than 300 Kiwikiu are estimated to exist. Their current range is extremely restricted – less than 3,000 hectares (7,413 acres)- largely protected within the Hanawi Natural Area Reserve, Haleakalā National Park, and The Nature Conservancy’s Waikamoi Preserve. Representing a monotypic genus, Kiwikiu are listed as critically endangered by the U.S. Fish and Wildlife Service. Factors attributed to the species’ decline include habitat destruction by humans and feral pigs, predation from introduced predators such as wild cats and mongooses, and avian diseases spread by introduced mosquitoes. 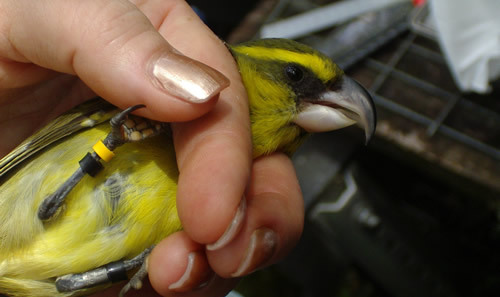 Current conservation efforts include monitoring the distribution and abundance population, response to climate change and avian malaria, and establishing a second population on leeward Haleakalā where they were once found.